Retrieve it via the web service. Your application will need to present the user with a queue where all of the fax metadata will be displayed and an option to view the document. Web service - you can poll the InterFAX API periodically (we suggest you use one of our libraries available here) and check if there is a new fax received (InterFAX limits developers from submitting more than 6 polling requests per minute). Once you had found there is a new fax, you can download the fax image. Lastly, once the image has been downloaded, you can mark the fax as “read” in order to avoid retrieving this fax message again in the future. Email - You can specify that the InterFAX system relay the fax to you via email (you can read more about setting up the email interface here). Once your InterFAX user is configured to receive faxes via email, anytime there is a new fax, an email will be sent to you with the metadata of the fax and the fax itself as an attachment*. 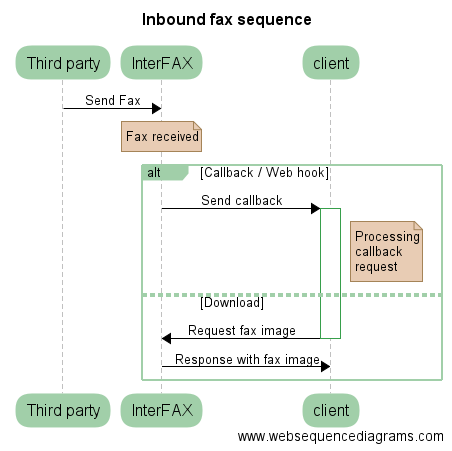 (*) If you are using the PCI-compliant service, you will receive a link to view the fax in the InterFAX secure control panel instead of the attachment. The diagram below shows the recommended sequence of events (there are many ways to achieve this behavior).